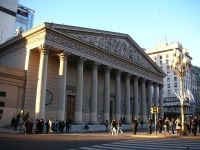 Situated in the Plaza de Mayo, the Neoclassical Cathedral Metropolitana houses the tomb of General José de San Martin, the revered hero who liberated Argentina from the Spanish. The General was originally buried in Franche, but his body was exhumed in 1880, transported to Beunos Aires and buried again, this time in a mausoleum designed by a French sculptor. The mausoleum is guarded by three sculptures, each a life-size female figure representing Argentina, Chile and Peru. The mausoleum also houses the remains of General Juan Gregorio de las Heras, General Tomas Guido, and the Unknown Soldier of the Independence. The cathedral has been periodically rebuilt and renovated since the foundation stone was laid in the 16th century. The current structure was finally completed in the mid-19th century. The interior has recently been renovated and the gilded columns, Venetian mosaic floors, and silver-plated altar are in pristine condition. Some interesting things to see in the cathedral are the two pulpits, made by the sculptor Juan Antonio Gaspar Hernandez, the director of Buenos Aires' first art school, a wide variety of colonial sculptures, a collection of very good colonial oil paintings, and the 1871 Walcker Organ containing more than 3,500 tubes, one of the finest examples of its kind.